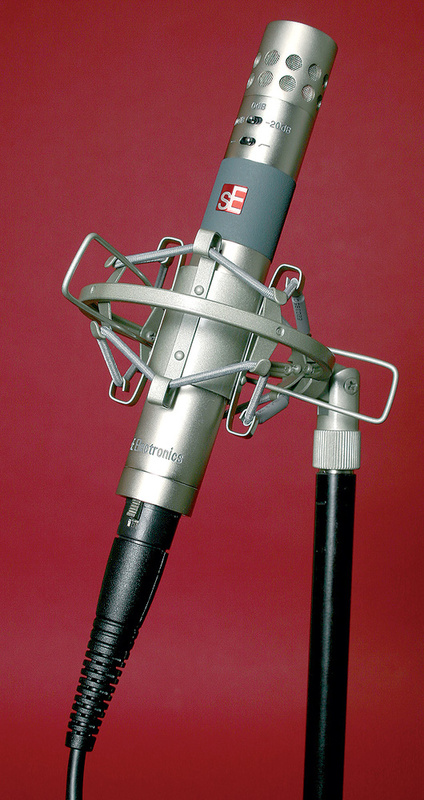 SE Electronics are now well-established as manufacturers of good quality, affordable mics. Their SE4, reviewed here, is an end‑address small-diaphragm condenser model that replaces the earlier SE3. In terms of electronics, it remains pretty much faithful to that design, but a re‑engineered housing allows it to accept new interchangeable hypercardioid, cardioid and omni capsules. The cardioid capsule comes as standard, with the others (which, incidentally, do not fit the SE3) available separately. The capsules can simply be screwed into place after first removing the cardioid capsule; a centre contact supplies the signal feed and the metal casework provides the ground connection. The mic body features a switchable 10dB/20dB pad, which is set via a three‑way toggle switch, plus a low‑cut filter. A transformer output, FET preamp design is used, with the usual balanced output on a conventionally wired XLR connector. Both individual SE4s and matched pairs are available, but because of the additional work involved in closely matching the hand‑made capsules, a matched pair costs a little more than buying two separate, unmatched single capsules. Our review kit comprised a stereo pair, which comes as standard with just the cardioid capsules fitted, packaged in a newly designed black and silver aluminium flight case, and there's provision within the cases to store up to two additional capsules per microphone. Both single and stereo versions come with an inclusive suspension shockmount, and the stereo version also comes with a T-bar for mounting. Outwardly, the capsule design looks virtually identical for all patterns — other than the polar‑pattern logo embossed into the surface, of course. There are two rows of circular vent‑holes on the side, protected by a fine, internal mesh, with a similar fine mesh protecting the face of the capsule. The housing itself is nicely machined from solid metal tubing. I was rather hoping there would also be a figure‑of‑eight capsule available, but at the time of the review none had been announced. 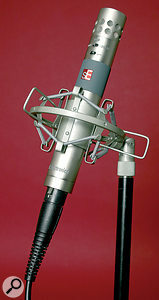 Both the capsules and the mic body have a satin metallic plated finish, with the body also featuring SE's distinctive grey centre‑section and red logo. With a diameter of just over an inch, the mic is slightly fatter than many 'stick' models, and at approximately seven inches it's slightly longer too. Many such mics have capsules around half an inch in diameter, but the SE4 measures closer to three quarters of an inch. All other factors being equal, smaller diaphragms should theoretically have a more accurate off‑axis response than large‑diaphragm models, but at the expense of a slightly worse noise performance — and microphone design is all about juggling such compromises, which are imposed upon us by the laws of physics. All three capsules have a quoted 20Hz‑20kHz frequency response, with a sensitivity of 12.59mV/Pa (0dB=1V/Pa 1kHz), and the noise performance is presented as an EIN (Equivalent Input Noise) figure of 14dBA. The 200Ω output impedance is typical for this type of mic, and all three capsules can handle SPLs up to 135dB before the distortion exceeds 0.5 percent — so they should be untroubled by all but the very loudest sound sources. Looking at these figures, the specifications are all fairly typical for a capacitor mic with a diaphragm of this size, and although you can buy quieter mics, a noise figure of 14dBA EIN is unlikely to give you problems unless you need to record very quiet or distant sounds. The mic has a nominally flat response, but with a presence bump up at 10kHz that's subtle enough to add a suggestion of air to the high end without being overplayed. 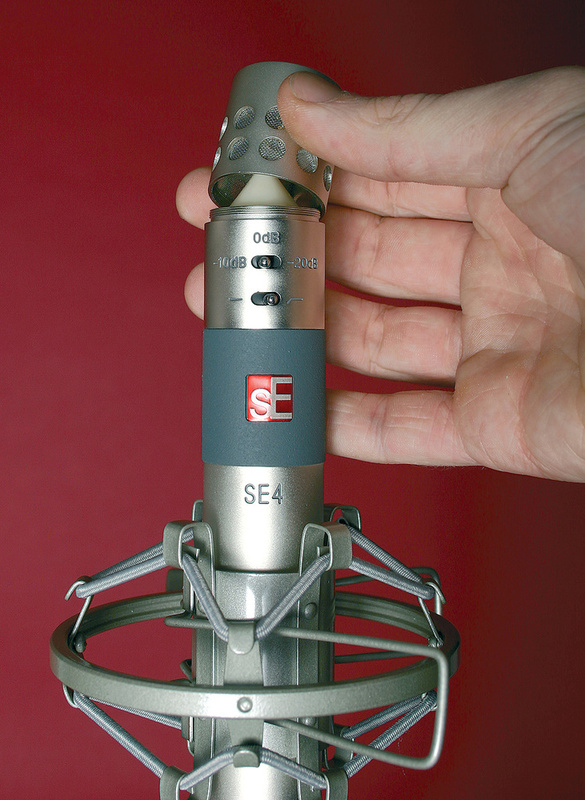 Like the earlier SE3, the cardioid capsule comes as standard, but on the SE4 it can be swapped for a hypercardioid or omni capsule, both of which can be purchased separately. My studio tests confirmed that the SE4 behaves very much like the old SE3, but with the obvious benefit of the switchable capsules. I don't often feel the need to use a hypercardioid mic in the studio if there's a cardioid available, although they can be useful tools for close-mic drum recording and other applications where you need separation. The omni pattern, on the other hand, is far more useful than most people give it credit for, particularly for 'natural' recordings, as it doesn't exhibit the proximity 'bass boost' effect. The mic's gentle presence lift helped to pull up details like the transient of a picked guitar, but I found that the extended low‑end response also balanced this with warmth and solidity. The SE4 represents a significant step up from the cheaper SE1. It's very well suited to recording acoustic guitar (particularly using the omni capsule with an acoustic screen behind), where the presence peak really brings out the zing in strummed parts, without sounding harsh or thin. In fact, it's good on most other acoustic instruments, come to that, including hand percussion. It fits the bill nicely as a drum overhead mic and a pair also makes a fine job of general‑purpose ensemble recording, such as choirs. I like the build quality, too: the mics are reassuringly solid, with very tidily assembled electronics, and the supplied metal shockmounts grip them firmly. Although multi‑pattern mics offer an alternative to interchangeable capsules, these are normally large-diaphragm models, and because the patterns are created by summing two back‑to‑back cardioid capsules, the resulting pattern is seldom as pure and vice‑free as that of a single‑diaphragm capsule designed to do the same job. This is especially true of the omni pattern, where a small-diaphragm, dedicated omni mic is likely to have a significantly more even off‑axis response. The SE4 slots into the price range just above the more crowded, budget end of the mic market, at a point where the user still wants something cost effective but is prepared to pay a little more for the quality they need. Although there's some strong competition out there — and you can get a mic that's technically better in some respects if you have much more to spend — the SE4 holds its own, doing a great job at a sensible price. The Rode NT55 offers strong competition and comes with cardioid and omni capsules as standard, but without the shockmount. There's also the CAD E70, the Sontronics STC1, Oktava's MK012, and the Studio Projects C4. Moving up the price scale, you could consider JZ Microphones' BT201, or the classic AKG option based on the C451 design. Same SE3 quality, but now with interchangeable capsules. No figure‑of‑eight capsule available at the time of writing. A capable and sensibly‑priced instrument mic that benefits from interchangeable capsules. SE4 single mic £194.35, SE4 matched pair £412.85; capsule kit (both capsules) £194.35; capsule kit (matched pairs) £412.85; individual capsules £109.25 each. Prices include VAT. Sonic Distribution +44 (0)845 500 2500. SE4 single mic $399, matched pair $849; capsule kit (both capsules) $399, capsule kit (matched pairs) $849; individual capsules $199 each. Sonic US +1 617 623 5581.